Every year, America honors our fallen soldiers by commemorating their time in war and showing respect for those who fought for our country. But, as Abe Hardesty from the Independent Mail tells us, there are more traditions than some of us realize. Retired. U.S. Army Master Sgt. 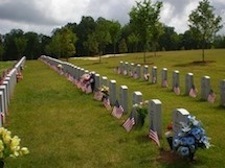 helps decorate the graves of local fallen soldiers. He is a member of one of four groups that decorate the many graves at the M.J. Cooper Veterans Cemetery in Anderson. The Powell Group recognizes every one of our fallen soldiers on Memorial Day as well as the people who make their final resting place a home. You may visit this and all surrounding areas here. Our team members wish you and yours a happy and safe Memorial Day.